Dogs for Good depends on the gifts people like you kindly leave us in their wills. Your gift will transform lives, creating more life-changing partnerships between people and dogs. Every year half of our funding comes to us from gifts that are left to us in a will, enabling us to continue to make incredible differences through our amazing dogs. We know that incredible things can happen when you bring people and dogs together. We train assistance dogs to support adults and children with a range of disabilities and children with autism. The results are life-changing. An assistance dog can enable someone to live independently, no longer reliant on carers or loved ones. They can mean a teenager has the confidence and freedom to go out on their own and join in with friends. They can protect and comfort a child for whom the world is a terrifying and unpredictable place. A gift in your will could help us train more life-changing assistance dogs. 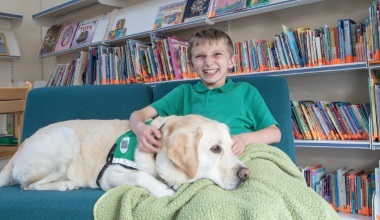 Read about Sam and his assistance dog Heather. Our dogs don’t just support individuals, they help whole communities. 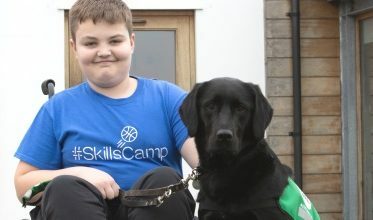 One of our projects has been training community school dog Patience to work in a Special Educational Needs school, where for many children their time in the classroom can present a great deal of challenges and difficulties. Our specially trained dog supports students both in group activities and in one on one sessions. The results have been remarkable. A gift in your will could help us train more dogs to reach many people in schools and communities. Meet community school dog Patience and see how she helps pupils at Stocklake Park School. We have seen time and time again the life-changing impact dogs can have on children with autism and their families. Our Family Dog workshops, run by specialist trainers, bring together parents and carers of children with autism to explore the helping potential a pet dog may have in their family. The results of these workshops have transformed lives, and brought the amazing potential of dogs to families across the UK. A gift in your will could enable us to help hundreds more families. 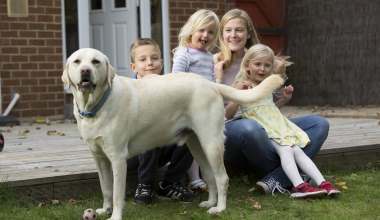 Meet Jacob and his family with pet dog Sam.